Yesterday I needed to visit the running store to replace my stretched out, overly large sports bra. I pulled up Google Earth, did a quick measurement and bam! The store is only two miles away. Certainly not worth firing up the car engine, so I walked there! For the curious among you, I’m trying a new brand of bra, Enell, thanks to several personal recommendations. I’ll post my own review here later after I’ve given my new uber encapsulating structural support system a good tryout. This snapshot doesn’t do the scenery justice (danged phone camera) but you get the idea. This is the Alien Light Beam* building, reflecting the gorgeous rain swept sky. The blue sky and purple clouds were just perfect! Today I need to visit a local shop to stock up on spices for baking season. It’s a trickier route because of traffic, but I think I’ll walk anyway. *At night, the entire top of this building is lit up like an enormous flashlight beaming into space. You can actually see the light piercing upwards into the stratosphere. AND…the light is colored. Seriously. Purple on TCU game weekends, Blue and Red for the Rangers, Red and Green at Christmas, Pink during October for Breast Cancer Awareness, Red White and Blue in July. Strangest bit of architectural frou-frou I’ve ever seen. 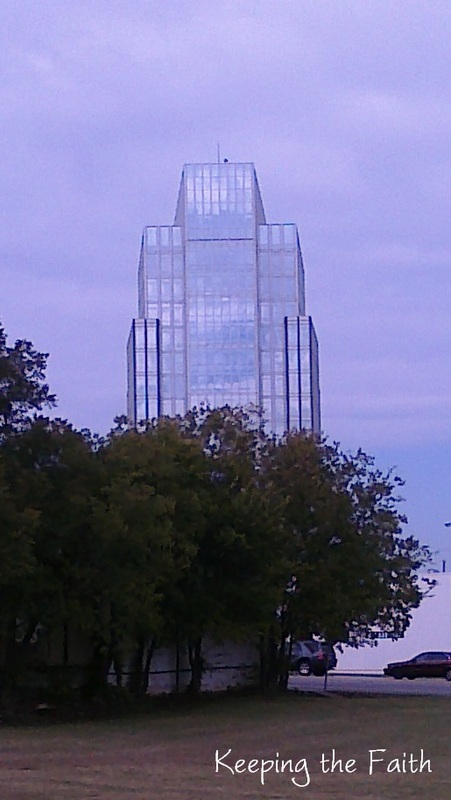 That building –I guess it's mirrored–it looks like it is pure glass and you can see right through it. Very cool.Good for you for walking. I should start walking to work. It's less than three miles. Neat picture! I can imagine how awesome it looked in person!Good idea to walk around to your needed errands! Very cool that your close enough to do that!! Nice photo. And good for you for walking to the store. Good for you – that's half my trouble – driving everywhere.That building is gorgeous.